As Syria sinks deeper and deeper into the throes of civil war, the decade-long honeymoon between Turkey's ruling Justice and Development Party (Adalet ve Kalkınma Partisi, AKP) and Bashar al-Assad's regime has all but ended. Fearing the possible spread of the revolt to Turkish territory, Prime Minister Recep Tayyip Erdoğan and Foreign Minister Ahmet Davutoğlu cold-shouldered their hitherto feted ally, openly siding with the rebels. They sheltered thousands of refugees fleeing government repression, including scores of military defectors, conferred with opposition leaders, and even threatened military intervention should the regime continue its brutal crackdown. In August, Erdoğan warned that "we reached the end of our patience"; three months later, he lauded the "massacred" rebels as "martyrs," prophesying that "the Syrian nation will reap the results of its glorious resistance." As President Assad ignores these admonitions, has Turkey reached the limits of "soft power" and will it revert to the instruments of hard power to find stability on its southern border? 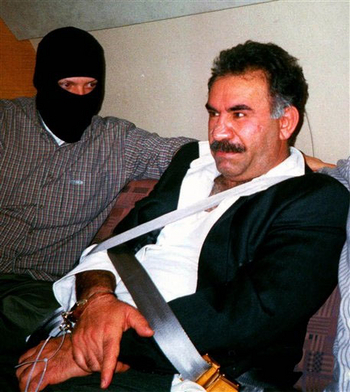 Kurdish rebel leader Abdullah Öcalan sits guarded aboard an aircraft en route to Turkey following his arrest by Turkish special forces in Nairobi, Kenya, February 15, 1999. Turkey and Syria have had a lengthy and fraught relationship due, in part, to Damascus's tacit support for the terrorist and separatist Kurdistan Workers' Party (PKK). A turning point came in 1998 when Syria, under compulsion, cut its ties with the group and forced Öcalan to leave the country. Historically, Turkey's strategy toward Syria was based on instruments of hard power, an approach that was, in part, shaped by Syria's sponsorship of the Kurdistan Workers' Party (PKK) in the early 1980s. In a bid to end Damascus's support for the armed separatist organization with which Ankara had battled for decades, the government executed coercive strategies against Syria on four separate occasions during the 1980s and 1990s. In 1987, Prime Minister Turgut Özal decided to use Turkey's control of the headwaters of the Euphrates and Tigris rivers as a bargaining chip against Syria. In return for securing its share of regional water resources, Damascus would be forced to stop backing the PKK. But this ploy failed, and Syria carried on supporting the group. In 1992, another coercion attempt failed when Ankara did not follow up its threats of retaliation for Syria's harboring of the PKK. The pressure eventually resulted in a short-lived accord in which Damascus agreed to clear the Helwe training camp of PKK militants. Yet, Turkish decision-makers failed to take further actions when, in 1993, Syria permitted the PKK to open a center where 1,000 militants were trained. In 1996, a third attempt was also unsuccessful as Turkey had to halt its saber-rattling against Syria due to the unexpected eruption of a crisis with Greece over the Aegean island of Kardak. The turning point in relations came with Ankara's final attempt in October 1998, which was backed by Washington and facilitated by Tehran and Cairo. This time the Turkish leaders made clear that they would use force against Damascus in the event of non-compliance. During the inauguration of the National Assembly, President Süleyman Demirel underlined Ankara's right to retaliate against Syria due to its support for terrorist activities; Chief of Staff Gen. Hüseyin Kıvrıkoglu stated there was an "undeclared war between Turkey and Syria," and Prime Minister Mesut Yılmaz subsequently announced that "the military was waiting for the order." Ankara also initiated a diplomatic offensive and military campaign to back up its threats and make them more credible, inviting television crews to the Syrian border to film the mobilization of Turkish armed forces for war (which was actually a preparation for the ongoing NATO "Dynamic 98" maneuvers in Iskenderun). Furthermore, Ankara announced that it was going to hold an independent maneuver at the Syrian border on November 7-9 with the aim of intimidating Damascus. It also declared that Reliant Mermaid II exercises would be held with the participation of Israel, the United States, and Jordan in October 1998. (The exercise was later postponed as a gesture to Syria when PKK leader Abdullah Öcalan was forced to leave the country.) Finally, as part of its diplomatic offensive to put pressure on Damascus, Ankara benefitted from Washington's strong backing. It also benefitted from the psychological impact on Damascus of close Turkish-Israeli relations and the shuttle diplomacy of Syria's friends Egypt and Iran between Ankara and Damascus. As a result, unlike previous efforts, the Turks' strategy succeeded this time. Ankara and Damascus signed the Adana accord, which declared the PKK a terrorist organization and stated that its camps in the Bekaa Valley would be closed, and Öcalan would never again be permitted to enter Syria. It also established a mechanism to monitor Syria's compliance with the agreement. Perhaps the most important consequence of the 1998 crisis, along with the defeat of the PKK, was the normalization of Turkish-Syrian ties. With the cessation of Syrian support for the PKK and Öcalan's extradition to Turkey from Kenya, the two countries could develop a more conciliatory relationship. Turkish president Ahmet Necdet Sezer's participation in Syrian president Hafez al-Assad's funeral on June 10, 2000, contributed notably to a warming of relation between Damascus and Ankara. Following Hafez's death in June 2000, Ankara welcomed Bashar's presidency, especially his interest in developing political and economic relations with Turkey. It was expected that as a young ophthalmologist who had worked in the United Kingdom, Bashar would introduce wide ranging political reforms. Initially this seemed to be the case as manifested in the so-called "Damascus Spring," in Bashar's initiatives to revive the economy, and his efforts to end Syria's isolation and improve its relations with the international community. Consequently, not only did diplomatic relations improve, but the Syrian government went a step further, taking strict precautions and eagerly cracking down on the PKK. Damascus closed the organization's camps within Syria itself, shut down its radio transmission lines, banned its demonstrations, barred PKK sympathizers from running in local and national elections, curbed distribution of PKK publications in Syria, ended anti-Turkey news and editorial lines in the state media, prevented border infiltrations, turned over PKK members with Turkish citizenship to Ankara, and accepted the immigration of 1,500 Kurds with Syrian citizenship from northern Iraq to Syria on condition that they not participate in PKK activities. In addition, Syria held several broad military operations against the PKK, acting both alone and in cooperation with Turkey, imprisoning the militants or surrendering them to Turkey. As a result of this demonstration of goodwill, Ankara established close ties with Damascus in several fields. In the realm of defense and the military, Gen. Aytaç Yalman, appointed in September 2000 as commander of gendarmerie to coordinate communication and consultation between the two countries, organized nine meetings on security and cooperation between October 1998 and January 2002. Further, the two countries signed a security protocol in September 2001 and a training and cooperation framework agreement in June 2002. In April 2009, they held joint military maneuvers. Ankara also viewed strengthening economic ties with Damascus as a key element to creating interdependence between the two states, viewing the integration of the Syrian economy into the broader global economy through Turkey as a potentially profitable opportunity. According to some Turkish decision-makers, Syria was, in a sense, Turkey's hinterland, and its economy could become a natural part of the Turkish economy. Both countries could thus benefit from each other's markets and act as bridges for one another to enter world markets. Thus Ankara hoped to benefit from Damascus's close ties with other Arab countries to increase its share in the larger Middle Eastern market; it was willing to open its borders as much as Syria would allow in order to accommodate cross-border trade and to create a free-trade zone, going so far as to eliminate customs restrictions. For this purpose, serious steps were taken when Turkey and Syria signed the free trade agreement in which both sides agreed to reduce customs taxes gradually until they would finally disappear. It was hoped that this greater integration would encourage Damascus to support a politically and economically stable Turkey and allow Ankara to enter the lucrative Syrian and Middle Eastern markets. These expectations began to produce results when the head of the Trade Chamber of Damascus, Rateb Shallah, declared that Turkish companies could benefit from Syrian free trade agreements with its neighbors by establishing joint investments with Syrian companies and sending their products to other Arab countries with zero customs levied. While the Turkish governments of the 1990s put serious efforts into improving relations with Syria, it was the Justice and Development Party, which came to power in 2002, that truly capitalized on the new opportunities. The AKP leadership envisioned a prominent role for Turkey within the greater Middle East context. In order to actualize this vision, AKP leaders decided to adopt the instruments of soft power—finance and trade, culture, ethnic and religious kinship, diplomatic activities—while the coercive tools of hard power took a backseat. The AKP's use of soft power was epitomized by Foreign Minister Davutoğlu's motto of "zero problems with the neighbors." This maintained that owing to its unique geostrategic position as a "central country" in the midst of Afro-Eurasia, Turkey enjoyed strategic depth that would allow it, through close relations with its immediate neighbors, to become a major regional and even a global actor. The AKP's success in building close relations with Syria and other Middle East countries was to rest on its understanding of these economic and political instruments and their full utilization. The AKP sought to utilize its historical and religious ties with the Levant as a soft power tool. According to its worldview, Turkey possessed a special responsibility toward the regions that it believed had thrived under Ottoman rule. In addition, as products of an Islamic political movement, AKP theorists viewed Turkey as a role model for the countries in the area, striving to revive what they perceived as the justice, fairness, and economic prosperity of the Ottoman era. This self-image also helps fulfill the expectations of AKP's constituents, sensitive to developments in the Middle East and viewing themselves as a key part of the Islamic world. This psychology was manifested when Erdoğan asserted during a December 2004 Damascus visit that he could not differentiate between the shining faces of Turks and Syrians and would thus call them his brothers, rather than his friends. Similarly during another speech, he addressed the Arab countries "not only as friends, but, at the same time, brothers." Some have dubbed this approach "neo-Ottomanism." The AKP's efforts to increase Turkish influence in the Middle East found unexpected support in the Turkish cinema and music industries. At least forty Turkish soap operas have been broadcast in the Arab world in the last decade. Turkish music, movies, and other television series have become instant hits in Arab societies; the finale of the Turkish TV series Noor was watched by approximately twenty-one million Arab viewers in 2009. One explanation of such popularity could be that Turkish films and videos provide an alternative, grassroots view of how predominantly Muslim societies can live, illustrating increased societal freedoms—especially in the case of Turkish women—and higher living standards, thanks to the Turkish liberalized economy. Following the lead of the previous government, the AKP emphasized the improvement of bilateral trade relations. In October 2009, the Strategic Cooperation Council, composed of ministers of the two countries, met in the Syrian city of Aleppo and the Turkish town of Gaziantep in a bid to improve bilateral relations in all fields. The AKP's vision of expanding its influence through strong trade relations with Syria was wholeheartedly supported by an army of umbrella organizations comprising Turkish investors, businessmen, and company officials. The Union of Chambers and Commodity Exchanges of Turkey, the Turkish Industrialists and Businessmen's Association, the Independent Industrialists and Businessmen's Association, the Turkish Confederation of Businessmen and Industrialists, the Turkish Exporters Assembly, the Foreign Economic Relations Board, the International Transporters Association. and the Turkish Contractors Association, as well as smaller, local business associations such as the Diyarbakır Chamber of Commerce, Gaziantep Chamber of Commerce, and Istanbul Chamber of Commerce had been actively involved in expanding their businesses in Syria. This led to a significant increase in Turkish-Syrian trade volume, from $824.1 million in 2003 to $1.84 billion in 2010. The two countries had hoped to reach $5 billion by 2012. In 2011 alone, Turkish companies invested a total of $223 million in the Syrian metal, food, cement, and open sea fishing industries. In addition, there was a considerable increase in the number of Syrian tourists visiting Turkey, from 154,000 in 2003 to 500,000 in 2010 while the termination of visa requirements for visits shorter than ninety days undoubtedly played a role in the success of both tourism and trade. As a result of these efforts, the AKP government appeared to have enhanced Turkish prestige throughout the Middle East as evidenced by Bashar al-Assad's reported request that Ankara help mediate Syrian-Israeli covert talks while Israeli minister of transportation and deputy prime minister Shaul Mofaz confirmed that Prime Minister Ehud Olmert had sent a secret message to Syria through Turkey in June 2007. The Olmert government had reportedly asked Damascus to take some constructive steps toward peace in return for Israel's withdrawal from the Golan Heights. By the same token, when Hezbollah abducted two Israeli soldiers in July 2006, Erdoğan sent Davutoğlu to Damascus at Olmert and President George Bush's request to ask that Assad use his influence on Hezbollah. For his part, Lebanese prime minister Fuad Siniora turned to Ankara for help to convince Damascus and Tehran to abandon their politically destabilizing strategies toward Lebanon. Although these efforts apparently came to naught, the fact that they were undertaken at all indicates a role for Turkey hitherto not contemplated within the Middle East's various conflicts. Another strong indication of Ankara's shifting policies was its open disagreement with Washington's approach toward Damascus, which resulted in a visible deterioration in U.S.-Turkish relations. This was perhaps most notable after the 2003 invasion of Iraq when Ankara's strategic interests coincided with Damascus's—and Tehran's—on a number of issues. All three states considered the possible partition of Iraq and the formation of a Kurdish state in its northern part a grave danger, fearing the domino effects of such a development on their own Kurdish populations. Syria, for example, had been concerned about its Kurdish population after the Kurds in Qamishli rose up against Damascus in March 2004 to protest violations of their human and political rights. In the ensuing years, the AKP government challenged Washington's tougher stance and mistrust of Damascus and argued that rather than exclude the Assad regime, U.S. administrations should support limited reforms in Syria. It argued that Washington's concerns about Syria—including its weapons of mass destruction programs, sluggish democratic reforms, support for Hezbollah, Hamas, and anti-coalition forces in Iraq, its meddling in Lebanese politics, and its acting as an Iranian agent in the Arab world—could only be resolved through dialogue. To this end, Ankara warmed its relations with Damascus in a number of ways. In July 2004, Erdoğan met with Syrian prime minister Naji Otri while refusing to meet Israeli prime minister Ehud Olmert who visited Ankara on the same day. In April 2005, President Sezer refused to cancel his trip to Syria while Lebanon was in the midst of its short-lived Cedar Revolution, instead taking the risk of being at loggerheads with the West. Turkey's relations with what had been its most important ally, the United States, were strained yet again when Washington criticized Ankara for harming the international efforts to force Syria's withdrawal from Lebanon, so much so that the Bush administration called Ankara's policy "unacceptable." This, however, did not deter Erdoğan from being at Assad's elbow in August 2008 when the latter met French president Nicholas Sarkozy and Qatari Sheikh Hamad Bin Khalifa al-Thani in Damascus to discuss the peace process with Israel. Ties between Turkey and Syria were further consolidated through Erdoğan's personal friendship with Assad, whose 2004 visit to Ankara was the first for a Syrian president in sixty-eight years. This was followed by the Assad family's one week holiday at a Turkish resort in Bodrum where the Erdoğan family met the Assads at the airport and had a lunch with them before traveling to their hotel together. The first ladies, Emine Erdoğan and Asma Assad, campaigned together for an endangered species, the bald ibis, while Emine Erdoğan visited Syria as Asma Assad's guest to talk about Turkey. The future of Turkish-Syrian relations seemed extremely rosy until the outbreak of the Arab upheavals in early 2011. Despite the many successes of the AKP's "soft power" approach, it was not able to sustain the influence on the Syrian regime it had expected, especially when it mattered most—during a time of unrest. With the rise of Syrian resistance to the Assad regime, beginning in March 2011, the Turkish-Syrian rapport began to deteriorate. The AKP government initially believed that its influence on and close ties with the Assad regime would exert a moderating impact on its behavior. After several attempts to stop Assad's brutality, including a lengthy meeting between him and Davutoğlu in August 2011, Ankara realized that the Syrian government was unwilling to resolve the problems through reforms and would continue to use force against its citizens. Hence Erdoğan's November 2011 endorsement of the rebels and President Abdullah Gül's proclamation that "our trust [for the Syrian government] has vanished." While Erdoğan and Assad's friendship has seemingly come to an end, Ankara's relations with Washington are becoming more closely aligned. The Turkish prime minister has been in regular contact with the administration since the start of the Syrian uprising, discussing the unrest personally with President Barack Obama. In late September 2011, the two leaders declared publicly that they were in agreement on pressuring Syria. While Ankara initially dragged its feet on imposing sanctions against Damascus (as Washington and Brussels have), it appears now to be preparing to make similar moves. During a recent interview with the Financial Times, Davutoğlu revealed that Ankara was preparing targeted sanctions against Damascus, which might include a buffer zone on Syrian territory. Ankara's support for Syrian opposition groups is one of the clearest signs of its break with Damascus. To this end, the Turkish government built several tent camps in Antakya, a city in southeastern Anatolia bordering Syria, to host eight thousand Syrian refugees fleeing their government's violent crackdown. One of the camps hosts defecting military officials. Modest in number (some seventy people although the Syrian opposition claims that hundreds of defectors fled to Turkey), they call themselves the "Free Syrian Army" and have been gearing to toppling the Syrian government. Their camp is protected by Turkish soldiers while their commander Col. Riad Asaad travels with a Turkish official. Part of the Syrian National Council (SNC), an umbrella resistance group formed in Istanbul in early October 2011, these Syrian rebels seem to have found a welcoming haven in Turkey. They have already met with Davutoğlu, and in the coming weeks, their tent camp will host Erdoğan. Turkish officials describe their help as purely humanitarian, and Asaad has confirmed that the SNC possesses no weapons and does not conduct armed training in the camp, contrary to the claims of a recent New York Times article. The shift in the AKP government's approach toward Damascus stems from a number of reasons, one being Turkey's desire to see the Syrian Muslim Brotherhood (SMB) come to power, or at least share power with Assad's Alawite regime. According to an Agence France-Presse report, during foreign minister Davutoğlu's lengthy talk with Assad in November, the former suggested Ankara would support Assad if the SMB, an outgrowth of the country's majority Sunni community, was given four major ministries. He also asked Assad to approve the SMB's return to Syria, after decades of exile. Reportedly, Assad rejected the idea on the grounds that the Brotherhood, as an Islamist party, was incompatible with Syria's secular character. Although the Turkish Foreign Ministry denied the story, a Turkish official did state that the ministry had warned the Syrian government to share power and make reforms. While Davutoğlu's proposal to Assad has yet to be substantiated, the AKP government's approval—if not support—of the SMB is undeniable. In April 2011, the Brotherhood held a conference in Istanbul where it denounced the Assad regime. In June, members signed a declaration in Turkey, along with other opposition groups, which called for "freedom of belief, expression, and practice of religion under a civil state." Indeed, SMB leader Muhammad Riad al-Shaqfa declared that Syrians would accept military intervention by Turkey, rather than the West, for protection from Assad's security forces. In addition to sharing a similar philosophy, a government ruled by a Sunni Islamist movement in Syria could help the AKP government consolidate its influence and power in the Middle East and North Africa in the coming years. In that sense, it was a positive development for the Turkish government when four Muslim Brotherhood members and six independent Islamists were selected among the nineteen members of the General Secretariat whose names were published by the Syrian revolutionary committee. Ankara's growing influence in the region was demonstrated during Erdoğan's September visits to Tunisia, Egypt, and Libya. Despite criticism of his intervention by Egyptian Muslim Brotherhood leaders, the AKP has emerged as a role model and mentor for political Islamist movements as exemplified by Tunisia's Annahda party's official adoption of AKP's line of thinking. A Sunni resurgence in Syria could also stymie Tehran's ideological and political expansion in the Middle East, dubbed the "Shiite Crescent" by Jordan's King Abdullah II in 2003. Iran, Syria, and its Lebanese proxy Hezbollah represent the most visible members of that group, but unrest in Bahrain and Tehran's growing influence on the Shiite-dominated government of Iraq have made Sunni leaders in Saudi Arabia, Bahrain, Jordan, and Qatar anxious. Thus, in the event of the Muslim Brotherhood coming to power in Syria, Turkey as its patron could gain leverage against its long-time rival Iran. The signs of strained Turkish-Iranian relations were already manifest in September 2011 when Ankara agreed to install new NATO radar systems to detect missiles launched from Iran, a step roundly criticized by Tehran. In the same vein, the recent declaration by SMB leader Shaqfa of his willingness to adopt the Turkish governance system, rather than the Iranian model, is another demonstration of the ongoing competition between the two states over regional leadership. The AKP government also learned from its slow start in the Libya case. Like Syria, Libya has been a lucrative market for Turkey. Turkish companies secured $15 billion worth of construction contracts from Tripoli. The volume of trade between the two countries was $9.8 billion in 2010, and Turkish companies initiated 160 investment projects. Like his relationship with Assad, Erdoğan also had a close friendship with Libya's ousted dictator Mu'ammar al-Qaddafi: The Turkish prime minister was invited as an honorary participant in the 2010 Arab summit in Sert thanks to Qaddafi and received the Qaddafi International Prize for Human Rights for his "distinguished service to humanity" in November 2010. Consequently, when NATO's involvement in the Libyan crisis began in March 2011, the AKP government dragged its feet. It was not until May that Erdoğan called on Qaddafi to step down. In all likelihood, realizing that the dictator's days were numbered, Ankara finally decided to back the NATO air campaign: It sent six vessels to support the naval blockade against Qaddafi's forces, sent a ship to evacuate Turkish civilians from Misrata, and began supporting the Libyan National Transitional Council (NTC). Further, following British prime minister David Cameron and French president Nicholas Sarkozy who backed the NTC from the beginning of the uprising, Erdoğan visited Libya to win the heart of the new government to which Ankara provided $300 million in cash, loans, and other aid. Unlike the Libyan debacle, this time the Turkish government appears to be anticipating the toppling of the Assad regime. Consequently, Ankara has started to prepare for the next phase of relations with a new Syrian leadership to protect the future of its investments in Syria as well as to establish a strong relationship with a possible Syrian government upon which it can expand its influence. Having said that, when the uprisings in Syria started, Erdoğan at first continued to support Assad, calling him "a good friend who was loved by his people." There were even some rumors, strongly denied by Turkish officials, that the first defector from the Syrian army, Hussein Harmoush, was expelled from Turkey and surrendered to the Syrian officials. However, unlike the Libyan case, this time, Ankara shifted its position quickly. Perhaps the most significant reason for this policy shift is Ankara's concern over news that the Assad regime has rekindled its relationship with the Kurds granting some citizenship and giving them more cultural rights—opening Kurdish schools, organizing meetings, and allowing them access to the country from Iraq—in return for their support for Damascus. There are claims that the Syrian government has once again been in contact with the PKK in an effort to find new allies inside Syria and possibly as retaliation against Ankara. There have also been rumors that Syrian support was behind the PKK's recent attacks that cost twenty-four Turkish soldiers' lives. Although no precise evidence against Syria was produced, Davutoğlu explicitly warned Damascus, "Recalling the past, [Syria] should not even think of playing the PKK card. Everybody will see where such an act would lead," clearly referring to the 1998 crisis when the two countries came to the brink of war. The tools of "soft power" have clear limits, especially when dealing with a nondemocratic state. Dependency created through trade, diplomacy, religious kinship, historical ties, or cultural similarities mean little when the destiny of a state depends on the whims of a dictator who feels threatened. Given the ruthless realpolitik of the Middle East, it is naive to believe that the tools of soft power can foster a meaningful change in such a setting. The problem with Turkey's "zero problem with neighbors" mantra was that it was tested against an authoritarian regime. Equally important, its aim was to better the relations with the regime rather than aiming at the population. None of the integral elements of an open, democratic society upon which the notion of "soft power" rests exist in this context. Consequently, Ankara could expect that its "zero problem" strategy would not influence the decision-making of other authoritarian regimes such as Iran. From a pragmatic point of view, Ankara has to make sure that the Assad regime is toppled and a new government in Syria is established. Simply in terms of Turkish domestic politics, a protracted Syrian civil war means increasing instability with a mass influx of Syrian refugees into Turkey and the possible revival of the PKK threat from across the Syrian border. Even if Damascus does not intend to use the PKK against Turkey, the PKK may attempt to take advantage of the unstable environment and a potential power vacuum in Syria to resume attacks on Turkey. PKK attacks launched from northern Iraq in the 1990s resulted in more than twenty Turkish cross-border operations, and such efforts from Syria could easily trigger a similar reaction. Ankara has openly sided with the SNC to reap the future material and ideological benefits of support for the movement. If its calculus works, Ankara may be one step closer to its neo-Ottoman aspirations, helping to spearhead predominantly Sunni, political Islamic movements in the Middle East and North Africa. This could, in turn, cause a negative reaction among those who consider Turkey a rival for the leadership of the Middle East such as the Saudi rulers. Against this backdrop, it may well be that Ankara's decade-long, improving relations with Tehran have come to an end. Turkey's support of the Syrian rebels explicitly threatens Iran's expanding power in the region and its ideological sphere of influence. Turkey may thus increase its cooperation with the West against Iran while Tehran might also start using the PKK as leverage against Ankara. After a 10-year honeymoon, Turkish-Syrian relations are back to square one. So long as the Assad regime continues to hunker down and massacre its citizenry, it seems that Ankara's stability, peaceful relations, and strong economic ties with Damascus will only be possible through the use of hard power instruments. Damla Aras is a postdoctoral research associate at the war studies department, King's College London. Ha'aretz (Tel Aviv), Aug. 13, 2011. AKP website (Ankara), Aug. 6, 2011; BBC News, Aug. 6, 2011. Haber50 (Istanbul), Nov. 1, 2011. Nihat Ali Özcan, PKK Tarihi, Ideolojisi ve Yöntem (Ankara: ASAM, 1999), pp. 246-52. Author interviews with Gündüz Aktan, former deputy undersecretary, Jan. 4, 2006; Atilla Ateş, former commander of land forces, Feb. 24, 2006; Mehmet Ali Bayar, former advisor to President Süleyman Demirel, Feb. 22, 2006; Süleyman Demirel, former president, Dec. 31, 2005; Cenk Duatepe, former ambassador to Syria, May 18, 2007; Korkmaz Haktanır, former Foreign Ministry undersecretary, Feb. 21, 2006; Rıza Küçükoğlu, former commander in second of the 7th army corps in Diyarbakır, Jan. 4, 2006; Faruk Loğoğlu, former deputy undersecretary, May 25, 2007; Onur Öymen, former permanent representative to NATO in Brussels, Mar. 26, 2007; İsmet Sezgin, former interior and later defense minister, Feb. 20, 2006; Necati Utkan, former spokesperson for the Ministry of Foreign Affairs, Feb. 20, 2006; Yaşar Yakış, former ambassador to Egypt, Dec. 1, 2006; Mesut Yılmaz, former prime minister, Feb. 22, 2006. The New York Times, Oct. 4, 1998; Hürriyet (Istanbul), Oct. 3, 1998. Hürriyet, Oct. 1, Oct. 3, 1998. Author interviews with Mark Parris, U.S. ambassador to Turkey, Oct. 6, 2006; Marc Grossman, U.S. undersecretary of state, Oct. 20, 2006; Harun Kazaz, The Turkish Daily News (Ankara), Oct. 4, 1998. The Turkish Daily News, June 13, 18, 2000. Sonoko Sunayama, "Bashar al-Asad's Syria: Will the Son Shine?" Mediterranean Politics, Summer 2001, p. 127; Eyal Zisser, "Bashar al-Assad: In or Out of the New World Order?" The Washington Quarterly, Summer 2005, pp. 117-8, 122; Eyal Zisser, "Does Bashar al-Assad Rule Syria?" Middle East Quarterly, Winter 2003, pp. 16, 19, 20-1; Eyal Zisser, "What Does the Future Hold for Syria?" MERIA, June 2006, p. 98. Milliyet (Istanbul), July 4, 2003, Dec. 28, 2004, May 17, 2005, Aug. 17, 2005; The Turkish Daily News, Apr. 5, 2007. NTV (Istanbul), June 9, 2002. The Jerusalem Post, Apr. 28, 2010; Time, May 26, 2011. Author interview with a high ranking Turkish Foreign Ministry official, June 13, 2006. See Damla Aras and Mustafa Aydin, "Political Conditionality of Economic Relations between Paternalist States: Turkey's Interaction with Iran, Iraq and Syria," Arab Studies Quarterly, Winter/Spring, 2005, pp. 21-43. Joseph Nye, Jr., "Soft Power and American Foreign Policy," Political Science Quarterly, no. 2, 2004, p. 256; idem, "Soft Power," Foreign Policy, Autumn 1990, pp. 154, 156, 167. Ahmet Davutoğlu, Stratejik Derinlik: Türkiye'nin Uluslararası Konumu (Istanbul: Küre Yayınları, 2001; Kemal Kirisci and Nilgun Kaptanoglu, "The Politics of Trade and Turkish Foreign Policy," Middle Eastern Studies, Sept. 2011, p. 711. Aksiyon (Istanbul), Dec. 27, 2004. The Turkish Daily News, June 9, 2006. See, for example, Hürriyet, Aug. 28, 2011; Omer Taspinar, "Turkey's Middle East Policies: Between Neo-Ottomanism And Kemalism," Carnegie Endowment for International Peace, Washington, D.C., Sept. 2008. Bobby Gosh, "Erdogan's Moment," Time Magazine, Nov. 28, 2011. Nurcin Yildiz, "Mehmet Muhenned Olunca," Usak Stratejik Gündem (Ankara), Apr. 14, 2010. Turkish Foreign Ministry, Ankara, Oct. 13, 2009. Kirisci and Kaptanoglu, "The Politics of Trade and Turkish Foreign Policy." "Turkey-Syria Economic and Trade Relations," Turkish Foreign Ministry, Ankara, accessed Dec. 23, 2011. Today's Zaman (Istanbul), Oct. 3, 2011. Milliyet (Istanbul), June 10, 2007. Ibid., July 6, 12, 2006; The Turkish Daily News, July 5, 2006; Bugün (Istanbul), July 4, 2006. The Turkish Daily News, Jan. 4, 2007. Milliyet, June 10, 2005, Feb. 1, 2007; Eyal Zisser, "Bashar under Pressure: Potential Implications of the Qamishli Riots," Tel Aviv Notes, Mar. 22, 2004, p. 2; Zisser, "Bashar al-Assad: In or Out of the New World Order?" p. 119; al-Ahram (Cairo), Apr. 8-14, 2004. Ibid., June 9, 2005; The New York Times, Jan. 24, 2007. Hürriyet, July 13, 2004; Yeni Şafak (Istanbul), July 14, 2004; Ha'aretz, July 16, 2004. Milliyet, May 12, 2005, June 9, 2005, Jan. 27, 2006. Sami Moubayed, "Turkish-Syrian Relations: The Erdogan Legacy," SETA Policy Brief, Oct. 2008, p. 7. Today's Zaman, Aug. 7, 2008; Gosh, "Erdogan's Moment"; Vatan (Istanbul), Aug. 5, 2008. The Jerusalem Post, Aug. 1, 2010; Hürriyet, May 13, 2005. The New York Times, Nov. 22, 2011. AKP official website, Aug. 11, 2011; Hürriyet, June 22, 2011. Financial Times (London), Nov. 1, 2011; Today's Zaman, Nov. 6, 2011; The Telegraph (London), Nov. 29, 2011. The New York Times, Dec. 8, 2011; al-Ahram Weekly, Nov. 17-23, 2011. Ty McCormick, "Turkey Mulls Buffer Zone on Syrian Border," Foreign Policy, June 17, 2011; Today's Zaman, Oct. 2, 2011; Anadolu News Agency (Ankara), Oct. 18, 2011; The New York Times, Oct. 27, 2011; Milliyet, Nov. 7, 2011. Agence France-Presse, Sept. 29, 2011. Piotr Zalewski, "Islamic Evolution," Foreign Policy, Aug. 11, 2011. Barry Rubin, "Obama Administration Does It Again! Empowers Largely Islamist Leadership for Syrian Revolution," GLORIA Center, Herzliya, Oct. 22, 2011. Edward Luttwak, "Revenge of the Sunnis," Foreign Policy, Dec. 7, 2011. Jacquelyn K. Davis and Charles M. Perry, "Rethinking the War on Terror: Developing a Strategy to Counter Extremist Ideologies," The Institute for Foreign Policy Analysis and Defense Threat Reduction Agency, Washington, D.C., Mar. 2007. Bloomberg News Service (New York), Nov. 28, 2011. "Arab Awakening Boosts Turkey's Confidence," IISS Strategic Comments, The International Institute For Strategic Studies, London, Oct. 2011, pp. 1-3; "Turkey's Position on the Libyan Revolution," The Doha Institute, Mar. 21, 2011. Today's Zaman, Dec. 1, 2010. Al-Arabiya News Channel (Dubai), Sept. 16, 2011; "Arab Awakening Boosts Turkey's Confidence," IISS Strategic Comments, pp. 1-3. Today's Zaman, Sept. 16, 2011. Los Angeles Times, Apr. 8, 2011. Today's Zaman, Oct. 30, 2011; Wladamir van Wilgenburg, "Turkey Is Afraid Syria Will Target Its Kurdish Achilles' Heels," Terrorism Monitor (Jamestown Foundation, Washington, D.C.) Nov. 11, 2011. Philip Robins, Suits and Uniforms: Turkish Foreign Policy since the Cold War (London: Hurst 2003), pp. 312–42. Related Topics: Syria, Turkey and Turks | Damla Aras | Spring 2012 MEQ receive the latest by email: subscribe to the free mef mailing list This text may be reposted or forwarded so long as it is presented as an integral whole with complete and accurate information provided about its author, date, place of publication, and original URL.